Nalanda is a historical place in central Bihar, India, 90 km south-east of the state capital of Patna. It is the place where one of the best known Universities of India existed. It existed for around 700 years, reaching its zenith under the Gupta rule, which is often called the Golden period of ancient India. The Chinese pilgrim Xuanzang recorded that Nalanda was home to students from various countries at its zenith. It is not inhabited now, and the nearest habitation is a village called Bargaon. Nalanda is important to the history of India, and that of Buddhism. Nalanda literally means the place that confers the lotus. The Jain Tirthankara Mahavira attained Moksha at Pavapuri, which is located in Nalanda. However, the site is better known for its importance in Buddhist history. The famous Nalanda University had been established at the site by the 5th century BCE and the Buddha is believed to have visited it and given sermons near «the Mango Grove of Pavarika«. Later, Nalanda University became an important Buddhist centre of learning, at its peak accommodating up to 10,000 students. Among the famous teachers there was Nagarjuna. The Tang Dynasty Chinese pilgrim Xuanzang left detailed accounts of the university in the 7th century. In 1193, the Nalanda University complex was destroyed by Turkish Muslim invaders under Bakhtiyar Khalji; this event is seen as the final milestone in the decline and near extinction of Buddhism in India. Many buddhist monks from Nalanda fled towards and into Tibet to escape the desecrating armies of Bakhtiyar Khalji. Those that remained were put to the sword. It is said that Khalji asked if there was a copy of the Koran at Nalanda before he destroyed it. 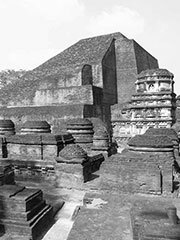 The destruction of the universities at Nalanda as well as the destruction of many temples and monasteries throughout northern India which housed centers of learning, is considered by many historians to the responsible for the sudden demise of ancient Indian scientific thought in mathematics, astronomy, alchemy, and anatomy. A vast amount of what is considered to be Tibetan Buddhism (Vajrayana) actually stems from the late (9th-12th century) Nalanda teachers and traditions. Other forms of Buddhism, like the Mahayana followed in Vietnam, China, Korea and Japan, found their genesis in the hallowed portals of the ancient university. Theravada, the other main school of Buddhism, followed in Sri Lanka, Myanmar, Thailand, Cambodia, and elsewhere, and later the mystic Theravada schools also developed here. A number of ruined structures survive. Nearby is the Surya Mandir, a Hindu temple. The known and excavated ruins extend over an area of about 150,000 square metres, although if Xuanzang‘s account of Nalanda’s extent is correlated with present excavations, almost 90% of it remains unexcavated. In 1951, a modern centre for Pali (Theravadin) Buddhist studies was founded nearby, the Nava Nalanda Mahavihara. Presently, this institute is pursuing an ambitious program of satellite imaging of the entire region.